An Ancient Solar System...: What if I drop Boris Johnson into Jupiter's atmosphere? What if I drop Boris Johnson into Jupiter's atmosphere? Before the police come knocking on my door, I should be clear: This is not a bizarre death threat against the former London mayor. I'm going to sketch out what a probe or astronaut falling into Jupiter's incredible atmosphere would see and making a well known person the star of that gives it a certain je ne sais quoi. That's my story. I'm sticking to it. Officers. You'll be fine Boris. Well. No, you wont. 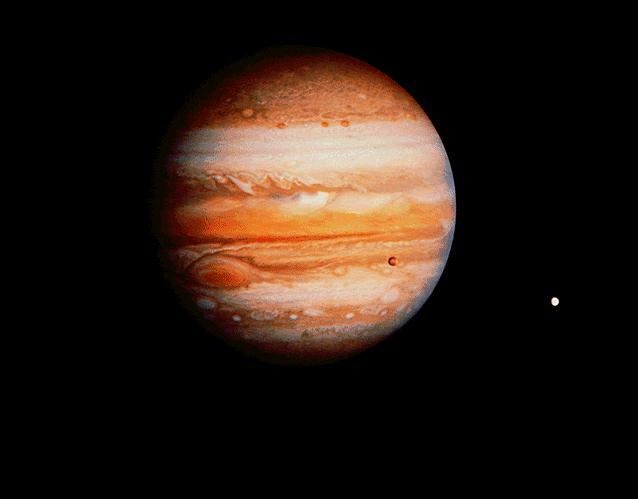 So, beyond the asteroid belt lies the biggest giant planet, Jupiter - a huge planet the size of a small star. Although only 1/13th the weight of the smallest things that might be called stars, it’s made mostly out of the gasses hydrogen and helium, like a star. But, because it lacks a star's searing heat, some of the trace components of it's atmosphere - like water, ammonia, and methane - can condense into cloud droplets and ice particles, giving Jupiter complex and colourful cloud systems. 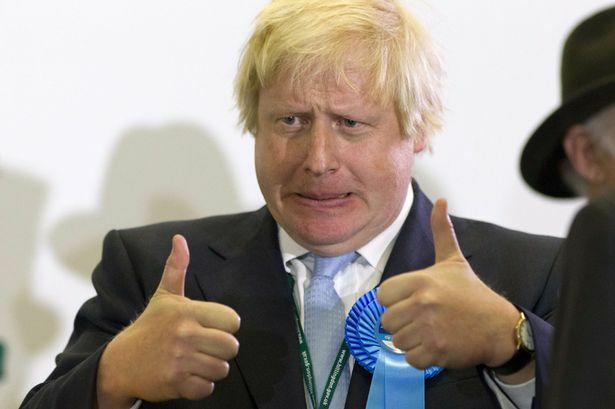 If we were to drop Boris Johnson, former mayor of London into that churning atmosphere – what would he experience? Being the inventive sadists we are (or at least, I am ) let’s imagine we can equip him with a suit that will keep him alive as long as possible. At first the fall will be silent, and seem almost motionless – we’re starting Boris a thousand kilometres above the level of Jupiter that has an air pressure of one Earth atmosphere. Here the atmosphere is thin to the point of being not much better than space. The gravity is two and a half times that of Earth but, in freefall, Boris won’t feel that. He will, however, easily exceed the speed of sound on this portion of is fall. A bit better than this, at least. That is, until he gets deeper into the outer layers of the atmosphere. As the atmospheric density climbs, reaching and passing a tenth of an Earth atmosphere (50 km above the 1 atmosphere level), Boris will slow, until he reaches a stable terminal velocity. His parachute opens and suddenly his plummet becomes a gentle drift. Ahem. Relatively gentle The wind speeds here, in Jupiter's upper atmosphere, are easily over 300 kilometres per hour. At the one tenth of an atmosphere level the air is too thin to carry much force, but as the astronaut drops and the pressure rises the winds increase in power, battering the politician turned astronaut savagely. To get a rough idea of what it'd be like, follow this link to the tale of a fighter pilot who had to eject from his plane inside a thundercloud. At pressure levels of 1-4 atmosphere’s the wind speed increases, then levels off at over 610 kilometres per hour. The temperature has been bitterly cold up to this point – over 150 degrees Celsius blow freezing – but as our intrepid ex-mayor is finding out, once you pass the one atmosphere point it begins to rise. 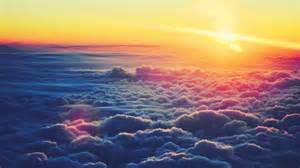 The one atmosphere point is also the top of the clouds: They’re about 50 km (31 mi) from top to bottom, and begin with hazes of ice crystals and organic compounds. They’re hardly visible to Boris, but they give way to thick white ammonia ice clouds, that block out the light. The thick ammonia ice cloud layer gives way to a layer of ammonium hydrosulphide droplet clouds (at a pressure of 1 to 2 atmospheres), then a lower layer of water clouds (at 3 to 7 Earth atmospheres) – it probably all takes at least an hour for the parachuting Boris to drop through. In the water cloud layer he’ll hear the occasional crack-rumble of huge lightening bolts - these are infrequent, but thousands of times more powerful than Earth’s. 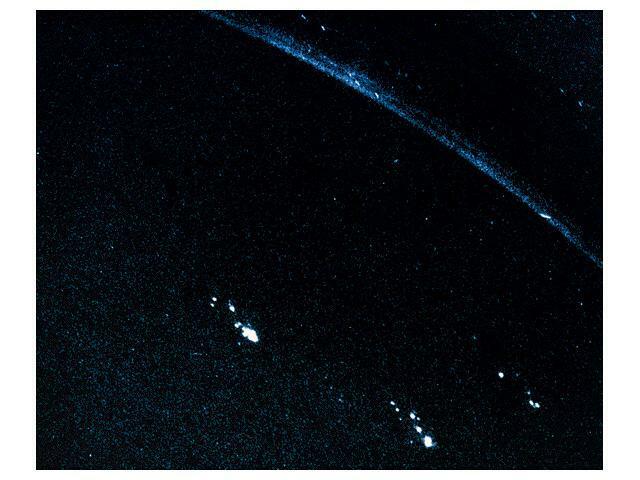 Above: Lightening storms on Jupiter, photographed from orbit. There might be something else in the water clouds: Life. Since the discovery of microorganisms that can live inside cloud droplets on Earth, any planet with a layer of water clouds has become a potential home for life. Of course, given the weather conditions Boris may shortly be making a return to the upper cloud layers, as there are immensely powerful updrafts which occasionally bring water clouds to the upper levels. 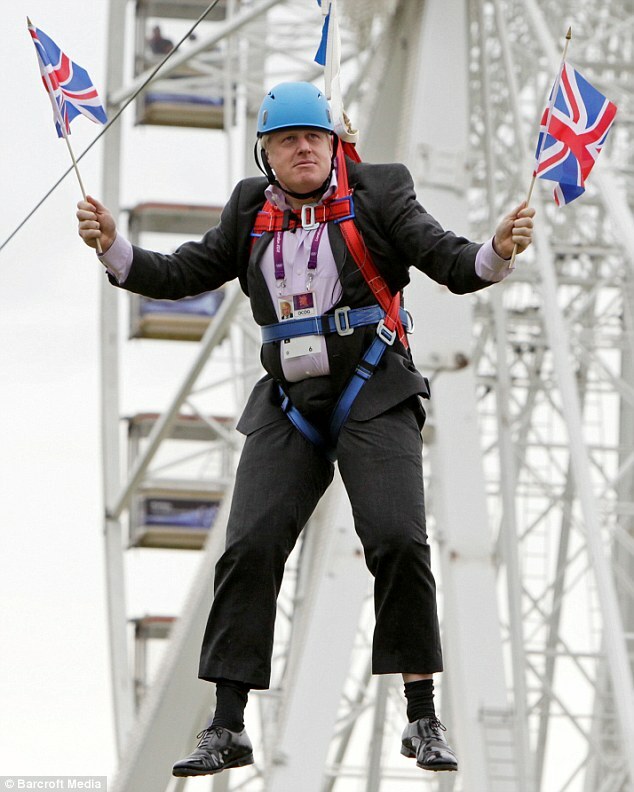 This could go on for a while - Boris being blown up and down the clouds by the immense winds. But eventually gravity will win. The intrepid Johnson will break through the bottom of the water clouds, and as he does he may be getting pelted by high gravity rain. Because of the high gravity the droplets will fall at a smaller size than on Earth, and travel faster – although the increasingly thickening atmosphere will lower the droplets velocity, so he needent worry too much. The other reason not too worry too much about the high gravity rain is that the temperature is rising rapidly, and the droplets are evaporating even as they fall: It’s 60 or 70 degrees Celsius as he exits the cloud deck. Although, as the temperature will only keep rising, he should probably be worrying about that. Boris is now falling (and slowly cooking) through a world of hazes and mists, with an unbroken ceiling of lightening streaked clouds. They stretch away to a vague horizon that seems much too far away to Boris’s Earth adapted eyes. As the air pressure climbs towards ten or twelve atmospheres, the temperature exceeds a hundred degrees Celsius. How long Boris lasts will depend on how good his fictional suit is, but the Galileo space probe, which parachuted into Jupiter's atmosphere, finally gave up at 132 km below the clouds at temperature of 150 degrees Celcius. By that point the probe was entering the layer at which the pressure and temperature were so high the atmosphere became a supercritical fluid – like the atmosphere of Venus it’s too thick here to be called a gas, but doesn’t act like a liquid either. It is however, quite clear – Boris, assuming he's still alive, can see that there’s still a very long way still to fall below him. By now hours have passed since the former London Mayor began his drop. As falls from grace go it is at least spectacular, and he is entering a truly strange realm. Surrounding Jupiter's core is a vast ocean of 'liquid metallic hydrogen' - a strange, electrically conducting, form of hydrogen that happens under immense pressures. There’s no definite surface to the liquid hydrogen sea, but Boris is heading into it. There's not much to see here, aside from the very distant flashes of lightening from the cloud deck - it's a long way up to sunlight, and everything here is pitch black. Sadly, neither Boris nor any probe we can currently build will reachthe ocean intact. About another 40 minutes descent after the point where the Galileo probe died any aluminium components of Boris’ protective suit will start to melt. If we built the suit out of titanium it will fare better – after falling into the ever thickening gasses for an astounding 6 and half hours, it would finally give up. Incidentally, since Tony Stark’s Iron man suit is made from a titanium alloy, this is how far it could get – although it’s doubtful any amount of insulation and cooling could keep the occupant from being cooked. The droplets of metal would keep falling for around another two and a half hours, before vapourising. By this point Boris' remains are well into the dark liquid metallic hydrogen ocean, well over a thousand kilometers below the relatively friendly cloud layers. The dwindling droplets of the suit have company here, on the last leg of their journey: It’s raining again. The rain drops are made of liquid neon, which is condensing under the bizarre conditions down here, producing a last rain of bright red droplets which fall until the still rising temperatures evaporate them. 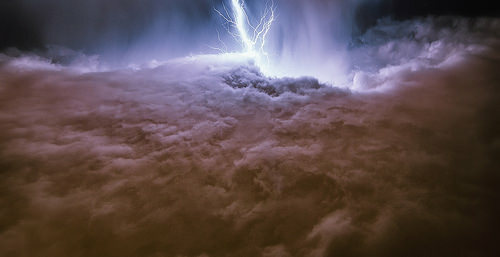 Above: The roiling, politician eating, lightening filled clouds of Jupiter.